Lesson 3: Меня зовут Наташа, а тебя? - My name is Natasha, and yours? to read an important phrase in Russian: "my name is..."
After the first two lessons, you are familiar with the Russian alphabet and you already know how to read the word "hi" in Russian. Now it is time to learn how to introduce yourself! In Russian when we want to say "my name is..." we use "Меня зовут...". Let's learn how to pronounce this phrase like native speakers. 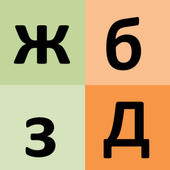 Some vowels are read in Russian differently in unstressed and stressed positions. The most important change happens to the Russian vowel "о". When unstressed it turns into the sound [a]. For example, "хорошо": it contains 3 times the letter "o", but only the last one is stressed and sounds [o]. We can already introduce ourselves and say our name! That's great! А т е б я? Letters: А т е б я? Below you can find a list of syllables that contain the letters you have learnt in this lesson. First, read them aloud. Then, listen to the recording in Russian and check how you did. Good luck!